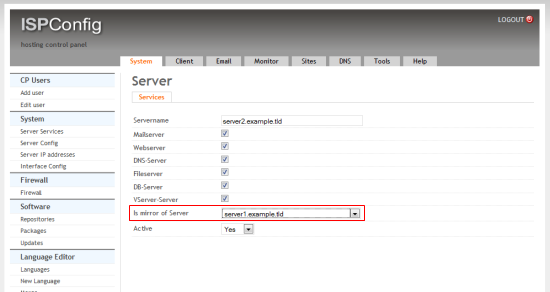 Select "server1.example.tld" in the "is mirror of" field and click on Save. When you want to activate a firewall on the master or slave server, ensure that you open port 3306 for MySQL on both servers. What I miss are postfix (queue) redundancy, amavis (temp + quarantine)redundancy as well as handling logfiles (if complete logfiles to be archived for some month -> Vorratsdatenspeicherung). Just copying /vmail from server 1 to server 2 isn't redundancy, the loss of mails is possible. How to switch between services (or servers) if one goes down or isn't reachable and how is load balancing solved? I also read that tutorial and this is too good. But i just want to ask if my master server goes down then how can i run services on server 2 so my webistes will not go down. Hello, What user and password i need to ISPConfig control panel login ? How IspConfig 3 manage the load balancing apache clusters sessions? this config for server1 or server2?? Anybody know what to do? So, the password for 'admin' user is 'admin' but the interface does not allow me to log on. Hello! First of thank your very much for this nice tut. I also solved the problem regarding to the login problem for the ISPconfig web interface. Only one thing I left: The configuration at the end "Connect Linux userid to webid". Do I have to set this configuration for both servers? 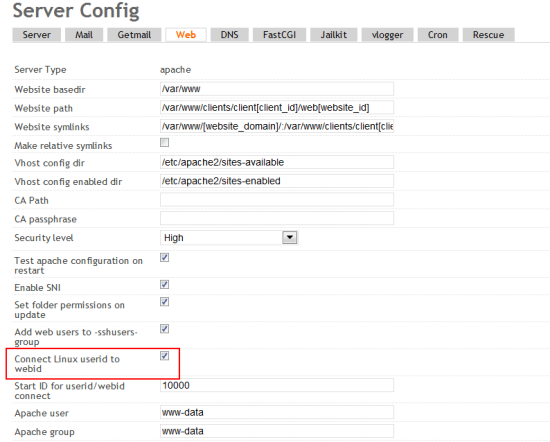 Same question: How IspConfig 3 manage the load balancing and HA?